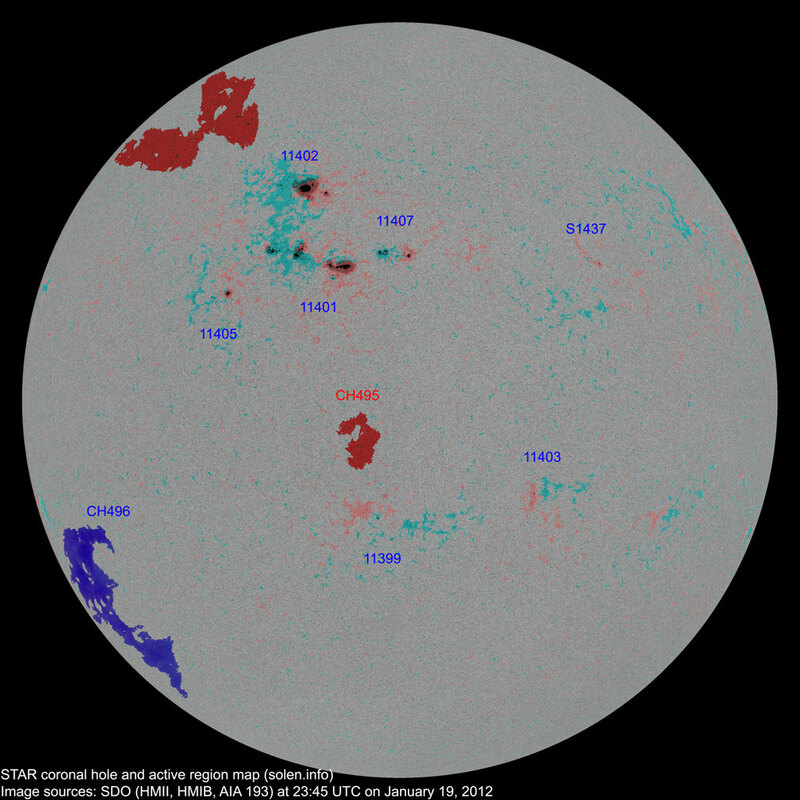 Last major update issued on January 20, 2012 at 05:40 UTC. 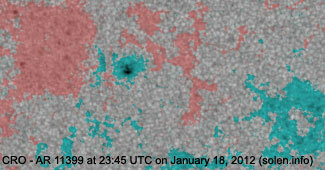 The geomagnetic field was very quiet on January 19. 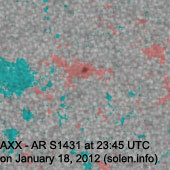 Solar wind speed ranged between 330 and 377 km/s. 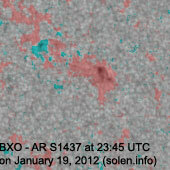 A weak disturbance was observed arriving at SOHO near 01h UTC on January 20, possibly related to CH494. 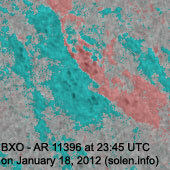 Solar flux measured at 22h UTC on 2.8 GHz was 150.9 (increasing 12.7 over the last solar rotation. 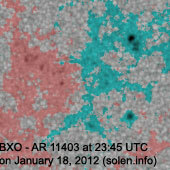 The measurements at 18 and 20h UTC at Penticton were both enhanced because of the LDE in region 11402. 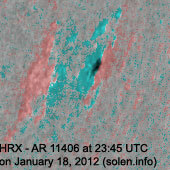 Even the measurement at 22h UTC was likely enhanced, however, it is the one which is the least influenced by the very long decay phase of the flare). The planetary A index was 3 (STAR Ap - based on the mean of three hour interval ap indices: 3.1). 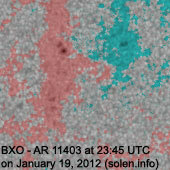 Three hour interval K indices: 11011101 (planetary), 01010211 (Boulder). 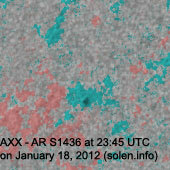 Region 11399 [S23E04] was quiet and stable. 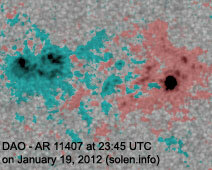 Region 11401 [N17E14] developed a magnetic delta structure as most of the central spots merged into a larger penumbra. M class flares are possible. 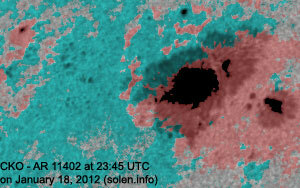 Region 11402 [N30E17] still has a large asymmetrical penumbra and could produce further M class flares. 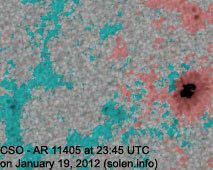 Flare: M3.2/2N very long duration event peaking at 16:05 UTC. 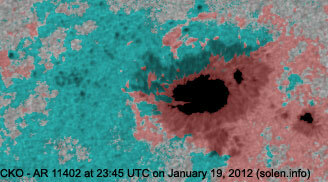 This event was associated with a fast and wide full halo CME. Region 11403 [S18W23] decayed slowly and quietly. 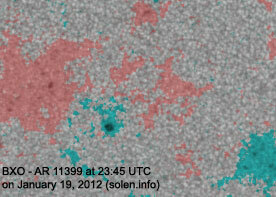 Region 11405 [N12E28] was quiet and stable. 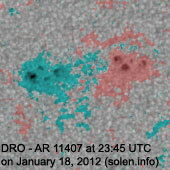 Region 11407 [N18E02] developed slowly and quietly. 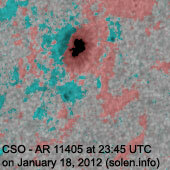 A poorly defined trans equatorial coronal hole (CH494) was in an Earth facing position on January 16-17. CH494 closed on January 17-18. 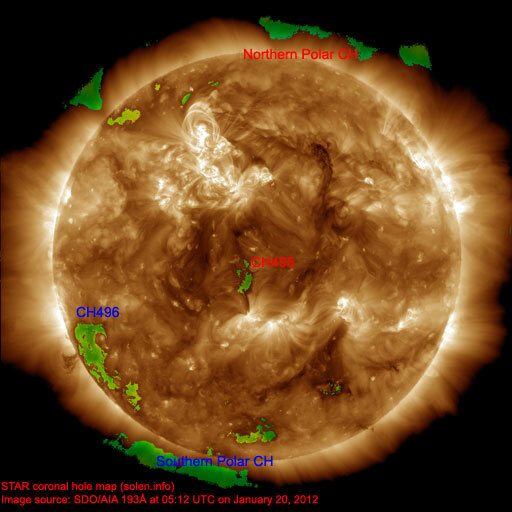 A small coronal hole (CH495) in the southern hemisphere will be in an Earth facing position on January 20. A large recurrent coronal hole (CH496) in the southern hemisphere could rotate into an Earth facing position on January 24-26. 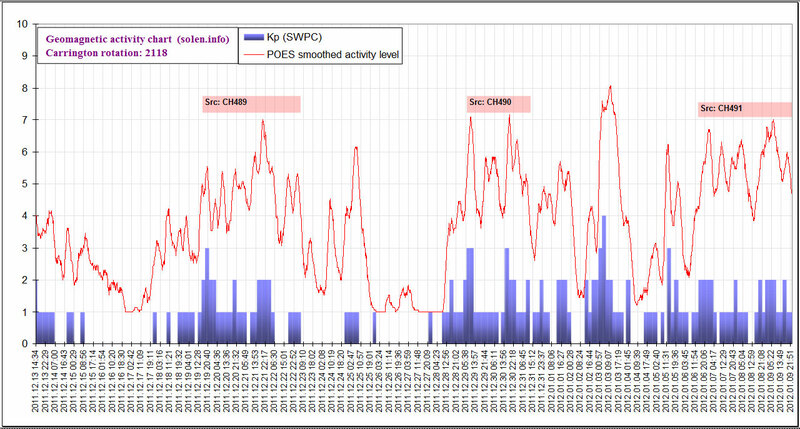 The geomagnetic field is expected to be quiet to unsettled on January 20 due to weak effects from CH494. 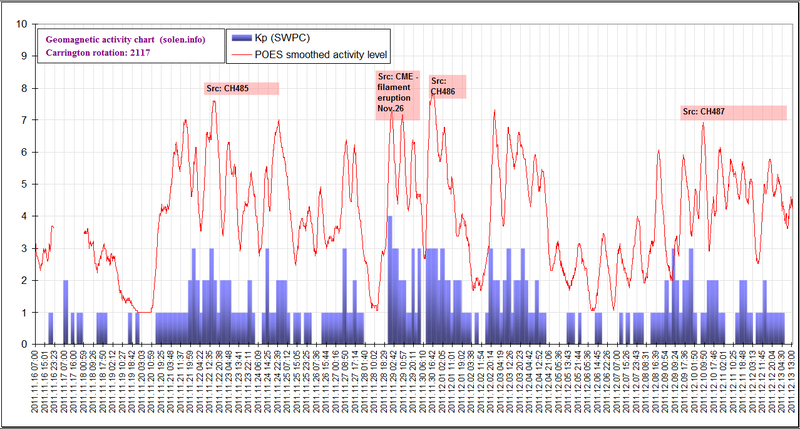 On January 21-22 quiet to major storm conditions are possible due to CME effects.